Simple LCD character display, interfaced to an ATmega328. LCD character displays are typically based on the Hitachi HD44780 display driver , and are available in a variety of colours and formats, including 16 characters x 2 lines, 20 characters x 4 lines, 16 characters x 4 lines, and 8 characters x 2 lines. The displays usually include an analogue contrast adjustment signal, and an LED backlight. 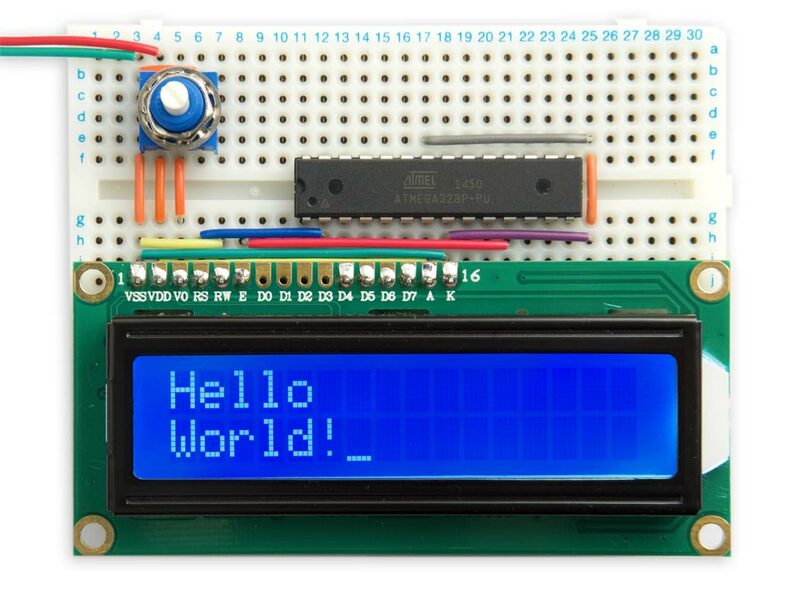 The following example is based on a 5V 16x2 LCD display   but should work with other displays. Alternatively if you need more advanced features, or have a different type of display, there's an Arduino Liquid Crystal library. The displays include a built-in ASCII character set, so the interface program is relatively simple. The displays offer two interface modes: 8-bit, or 4-bit. This application uses the 4-bit mode which saves I/O lines by sending the data in two 4-bit parts, using just D4 to D7. I first tested this program in uLisp, my Lisp for the Arduino, before converting it into C; see LCD character display. Circuit of the LCD character display interface. Tip: Don't fit pin headers to the pins D0 to D3 on the display module; these aren't used, and leaving them unconnected may allow you to save some wiring between the Arduino board and the display module, as in my prototype in the photograph above. 0x33 and 0x32 put the display into 4-bit mode. 0x0e turns the display and cursor on. Change this to 0x0c if you don't want a cursor. The first two commands are designed to work whether the display is initially in 8-bit or 4-bit mode, as follows. where xxxx are the 'don't care' states of the lower-four data lines, D0 to D3. These leave the display in 8-bit mode. which put the display into 4-bit mode. 0x80 moves the cursor to the start of the first line. 0xc0 moves the cursor to the start of the second line. 0x0c turns off the cursor. 0x0e turns on the cursor. Compile the program with my ATmegaBreadboard hardware configuration on GitHub, following the instructions there to add it to your Arduino hardware folder: ATmegaBreadboard. Select the ATmega328 option under the ATmegaBreadboard heading on the Boards menu. Then choose ATmega328P, 8 MHz (internal), and B.O.D Disabled from the subsequent menus. Choose the correct programmer from the Programmer option on the Tools menu; for example, USBtinyISP if you're using the Sparkfun Tiny AVR Programmer. Choose Burn Bootloader to set the fuses appropriately; then choose Upload to upload the program. ^ HD44780 datasheet on Sparkfun. ^ 16x2 LCD Display White/Blue LED Backlight on HobbyTronics. ^ Standard LCD 16x2 + extras - white on blue on Adafruit.